Mei Støyva is one of our dreamy greeting card illustrators here at Ohh Deer. With her super fun characters and bright colours; her cards definitely have presence on the shop shelf! Mei gives her advice to those who are wanting to go freelance, along with her illustration challenges. Let's talk! Along with illustrating super fun cards for Ohh Deer, you have also had to balance other jobs. How did you find the work/freelance balance? Do you have any tips on managing your time and keeping up the motivation? Hello, lovely to be here! Finding the time, energy and motivation to keep working in what was technically my spare time whilst also working a full time job was definitely a challenge! I think there's a big pressure on people these days to kinda do everything all at once, so my first advice is to not take on more than you feel you can handle, and not feel bad about taking breaks! Personally I found that freelancing on top of work was something I could only do for a few months at a time before needing a few months off — so it was kind of a bit like interval training! In terms of motivation, i love listening to podcasts but will only allow myself to listen to new episodes if I'm working on freelance stuff. That way if I wanted to know what happens next on, say, The Adventure Zone (my favourite podcast! ), I'd have to keep working, or stay in the dark and risk spoilers! We will have to check out that podcast! Your work features cute animals and tonnes of happy colours! Do you find that animals are the most enjoyable things to draw? I do absolutely love drawing cute animals! One of my main goals when coming up with new ideas for cards and stationery is to make something that'll make people happy, and I find cute animals always put a smile on my face. I particularly like drawing animals like crocodiles and wolves where you can get a real big toothy grin in, and I also have a soft spot for large, round animals such as elephants and hippos, as well as cats and puppies. It's all about spreading those good vibes and doing my bit to make the world a slightly brighter place to be! ...and what is something that you find quite challenging to illustrate? It's a bit silly, but I’ve always found backgrounds to be quite challenging and have, in the past, been so worried about my inability to draw trees that I’ve ended up setting stories in the desert or in space just to avoid having to drawing them! I would love to be able to draw beautiful backgrounds and landscapes though, so this is something I'm actively trying to get better at. I've promised my brother Fred I would paint him a landscape for the cover of his next EP so hopefully I'll have mastered how to draw trees by then! You can harness the background power Mei! With such a graphic style, how do you go about creating your designs and are you always finding new and interesting ways to bring your ideas to life? I do love a challenge and I'm always looking to improve as an artist and learn new stuff. In my previous job I did a lot of icon design, and one of the things I found super interesting about designing icons is that even when reducing something to its most basic shapes and forms there are still so many ways to draw the same thing and interject your own personality into it. So I'm always thinking: can I make this simpler/bolder? Can I reduce the number of colours but still make it look soft? Can I make this fun without it feeling too cluttered? And hopefully somewhere along the way I'm able to strike that balance between fun and soft and bold and striking, and if I can't I'll scrap the design all together and start over! 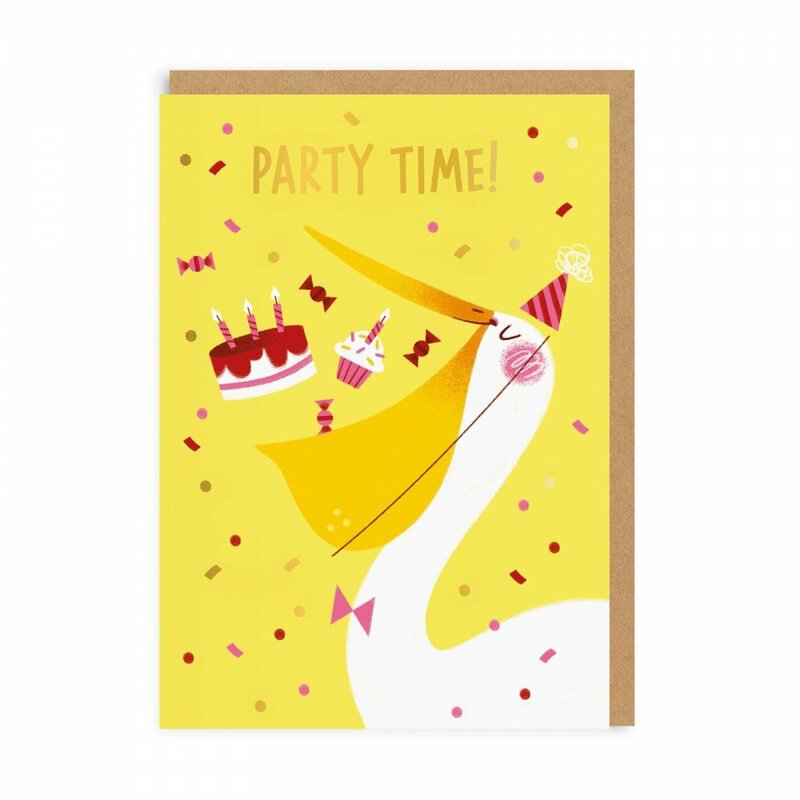 What is your favourite card you have illustrated for Ohh Deer?! Our fav has to be the wedding bears, they are adorable!!! Aah thanks, I'm glad you like them!! I'm quite fond of the cat in the gift box — I'm quite shy, especially at parties, so people have had to coax me out for my birthday before! I'm also a big fan of the birthday hippo — there’s something about big animals holding small things that I really enjoy. A friend of mine whose mum is a famous actress also told me that he gave her my ‘Stay Sassy Mum’ card for Mother’s Day and she loved it, so that one holds a special place in my heart as well. Not that I’m totally enamoured with my own work or anything, it’s just hard to choose! Tell us more about your education – did you study a creative subject or was this something that was a happy accident? When did you realise “Hey, I’m actually pretty good at this!”? My family is super creative so I kinda always knew I’d end up doing something creative too. I tried a few different things (...I played the piano for ten years before developing stage fright…!) but always had a penchant for drawing — my parents would often ask me to draw for them when I was younger, which I think really helped me get into it as a kid. I also loved reading Donald Duck comics from an early age, which inspired me to explore drawing characters and making up comics of my own. In my teens though, I got really into design, and so that’s what I decided to study at university! It wasn’t until my third year studying graphic design at Middlesex University that I thought to use some of my illustration skills for my FMP, a picture book about a space traveler and her space dog companion. I remember one of my tutors exclaiming “Mei! You never told us you could draw!” when she saw it — I think that’s maybe when I realised I was onto something with the style I’d developed for my kid’s book and decided to explore this avenue further, eventually leading me to where I am today! As a final and useful question; Do you have any advice for those who are wanting to take the plunge into freelance illustration and how do you suggest they get their work out there?! Posting your work online I think is really important, making sure your online portfolio is up to date and easy to use, and also posting to sites like Behance and Instagram. Sending a PDF portfolio with a selection of your work directly to companies you’d like to work with can also be a good way of making sure you get your work in front of the right people, and if your style fits their brand I think there’s a good chance they’ll get back to you! Getting the ball rolling can be hard though, so I wouldn’t be discouraged if it takes a bit of time to get things going. I can't stress enough how lucky I've been that I'm able to make a living out of doing what I love, and although a lot of that is down to hard work, I imagine it’s also a case of having had the right people see my work at the right time. The internet can be a difficult place to navigate — how popular you are online doesn’t necessarily correlate with how talented you are, so don’t get too hung up in likes and followers, just do good work and make sure it’s seen by those who matter! You're welcome Mei! Thank you for sharing your illustration experiences! You can follow Mei on Instagram @meistoyva or view her website here. Check out her greeting cards over on ohhdeer.com!